Since June, 2013 swarms of dying starfish have been riddling the North American western coast. 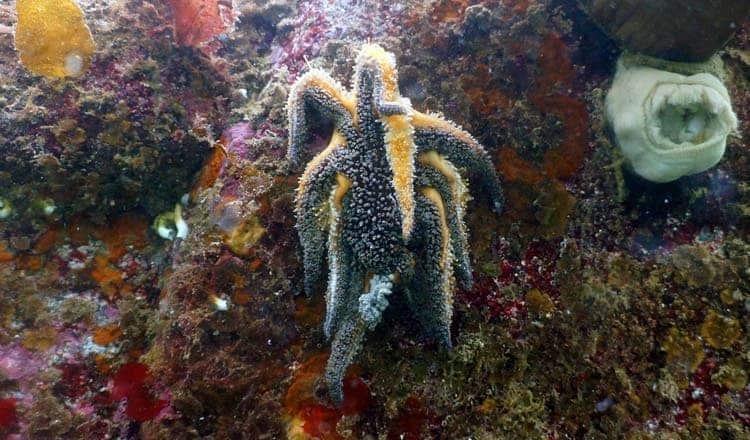 The disease, called sea star wasting syndrome (SSWS), causes the star-shaped echinoderms to first curl from the tips, then swell and twist like a pretzel, followed by festering sores appearing on the flesh and ending in complete degeneration. A starfish hit by SSWS is unrecognizable after the disease eats up the animal – it leaves nothing but mushy, paste-like matter. Many theories have been proposed to explain this enigmatic die-off, ranging from pollutants, to global warming, to a viral outbreak. A recent study seems to point to the latter conclusion, after researchers led by Ian Hewson from Cornell University found significant evidence that a virus called SSaDV may be the likely culprit. In a year or so, some 20 starfish species became infected with SSWS as mountains of these washed ashore all along the Pacific, from Alaska to California. Once thriving populations have now disappeared. The disease isn’t new, however. 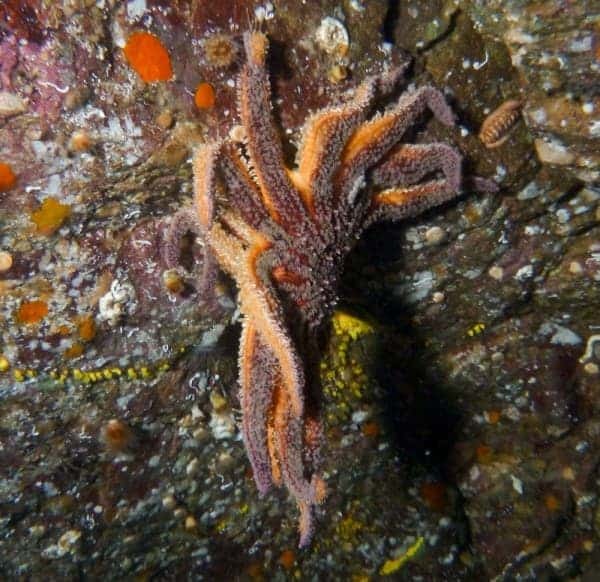 Reports of SSWS can be found as early as the 1970s, yet the scale at which the disease has spread and affected starfish populations in merely a year is unprecedented. Worst off, scientists are left scratching their heads as to the cause of all this. They were finally tipped to some clues after starfish populations confined in aquariums started catching the disease. The aquariums drew some of their water straight from the ocean, yet those facilities which treated their water first with UV light didn’t experience any die-offs. This was stage 1. Scientists had finally some information to draw some limits: it’s either a pathogen or a chemical agent. Next, water was fed through filters with extremely small pores that keep bacteria out, but big enough to let viruses slip through. Within a few weeks, the animals in the tank started wasting. The animals which laid in water that was initially boiled were completely healthy. Following this line of reasoning, Hewson and team were convinced they were dealing with a viral infection. A starfish is riddled with viruses, though. How to find the culprit? The researchers sequenced the DNA of various starfish species, both healthy and wasting. Their analysis is far from conclusive, but the team believes they may have found a likely culprit – a new densovirus called SSaDV. It’s inconclusive because both healthy and unhealthy animals bore the virus, yet the symptomatic ones had the virus in much greater numbers. Even so, some samples of wasted starfish didn’t contain any trace of the virus at all, but there may be an explanation for this and other odd patterns that don’t seem to indicate SSaDV as the killer. “If you take a sea star and divide it into pieces, you can detect virus in 80 percent of them. So 20 percent will be a false negative,” Hewson says. The virus belongs to a larger family of viruses called Parvoviruses. After analyzing stored samples, the authors were able to find the virus in old starfish collected as far back as the 1940s. Why now? Why this fury? The situation seems to be cast under a shroud of doubt, and even if the wasting may be caused by the SSADV virus, the system might be a lot more complex than we currently imagine. For instance, it might be the case that warmer waters have helped foster the virus. In the past couple of years, starfish populations have grown quite a lot in numbers. It’s not unheard of that viruses activate when they sense host populations reach a critical level, according to the researchers. After Hewson and team study the virus in more detail on isolated cultures, we might be able to learn more and set things straight. Even if they perfectly uncover the wasting mechanism, however, there’s little they can do to diffuse the problem. Imagine trying to spread the cure through the ocean to millions of starfish. This isn’t the point. “We’re just trying to understand this as a natural phenomenon,” Hewson says. Findings appeared in the journal PNAS.